Carbine Studios wants each WildStar player, regardless of class, to be rewarded for the play-style of their choosing. Classes are a pretty big part of MMORPGs, but in the grand scheme of things, they don't dramatically alter gameplay. Whether you're a Healer or a Tank, you're still completing the same quests, fighting the same enemies, and earning experience points on the same pre-defined behaviors. Carbine Studios wanted to do things a little differently with WildStar, so it implemented a Path System that offers unique objectives and rewards for each class. According to producer Jeremy Gaffney, not only does this offer greater variety between characters, but lets each player develop however they choose, right up to the endgame level. "Unless you're in the bulk of players you feel under-served all the time because games are built to appeal to as broad an audience as possible," Gaffney says. "So what we're trying to do is have a world where you get rewarded for playing your type of game in our world, rather than smacking you in the head and telling you you're playing it wrong." What does this mean in practical terms? Suppose you're playing as a Settler, which is WildStar's social class. By following a Settler's path, players earn experience and rewards for assisting other players in their goals. One way to do this is building Campfires, which provides buffs to any character who stops at one. In turn, the Settler will receive additional experience bonuses for each player at a Campfire, fueling their own development. The same principle can be applied to each WildStar path, whether you're a lore-collecting Scientist, an adventurous Explorer, or the traditional "kill everything" Soldier. The concept reminds me a bit of Team Fortress 2, where the varied play-styles and interactions of each class creates a more complex and engaging game world. 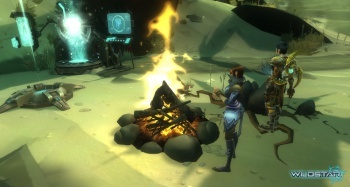 In WildStar's case, paths sound like a great way to develop characters as well, although Gaffney notes that the system has a place in endgame content. "It turns out that Paths are a fundamental way people play games and our testers wanted more Path stuff and we listened," Gaffney explains. "We've been adding more Path content at the elder game level because players demanded it, and they were right of course." Whatever path you prefer, players can register for WildStar's closed beta at the official website.